Ulsa Shield is an advanced, sugar free formula containing a unique blend of ingredients to maintain gastric health, soothe the stomach walls and support normal acid levels. It contains pre and probiotics to support a healthy gastric environment. 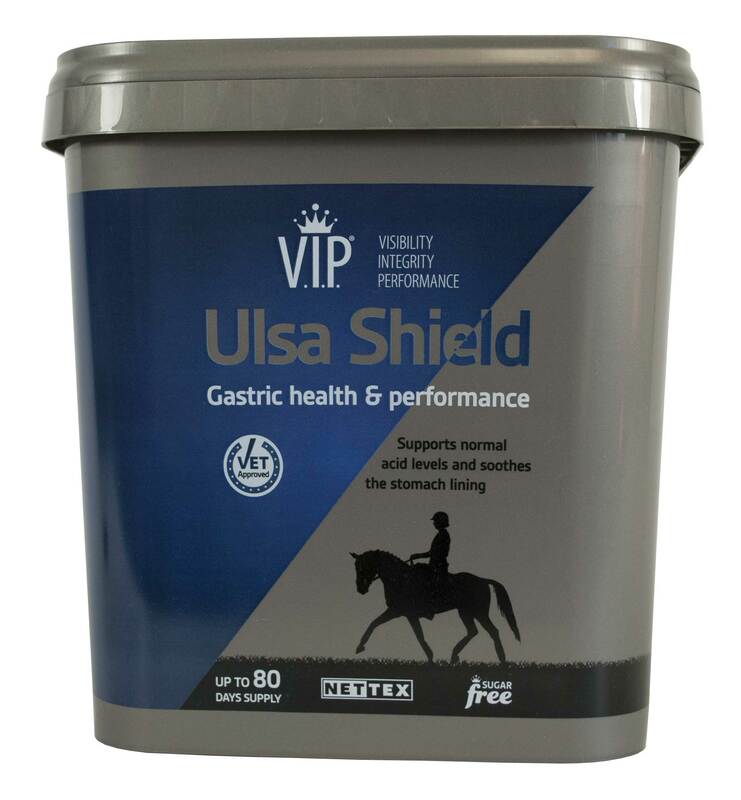 Ulsa Shield is Vet Approved and is ideal to feed following veterinary treatment to help maintain a healthy gastric environment. Results visible from 5 days. PREBIOTICS - Diamond V, a unique prebiotic that has a positive effect on nutrient digestibility, FOS to support normal acid levels, plus MOS, Psyllium and Brewer’s Yeast. PROBIOTICS (Saccharomyces cerevisiae) - To support gastric health. LIMESTONE FLOUR - To support normal acid levels. RICE BRAN OIL - To support gastric health in the glandular region of the stomach. ALFALFA MEAL - Naturally high in calcium to support normal acid levels. LINSEED MEAL - Rich in Omega-3 fatty acids. HERBAL EXTRACTS - Yucca, Fenugreek and Ginseng to support gastric health. VITAMINS & TRACE ELEMENTS - To support overall health, vitality and condition. The lifestyle of modern horses can predispose them to stress and poor gastric health. Ulsa Shield is the ideal gastric supplement which can be fed continually to achieve healthy performance in the stomach. Please Note: Can also be fed at a concentrated level in the lead up to a stressful situation (e.g. travelling or competition) 3 days prior and for 3 days afterwards at the stated loading rate.